Seems underutilized. This is a premium 3drop in any deck that runs a bunch of minion buffs. Why does no one seem to use this with paladin, the class with stuff like blessing of kings, divine strength, hand of protection, seal of champions, blessing of wisdom and blessing of might? She's A LOT better than Fjola Lightbane. Hey, what about this card + Explorer's Hat ? Great card for priest, but seems to slow, because on turn 4, 3 dmg means nothing. Using it in Dragon Priest at the moment, and it's been a nice little addition. At it's worst, it demands instant attention, and typically it sees play in combo with at least one spell. Is this a game-changing legendary? No. But it does make a nice little option in Priest (and probably also Mage, Pally, and Rogue). I don't see why ppl think this is better than Fjola Lightbane. In most cases divine shield is like 3 non random damage, which can be increased further with attack buffs. 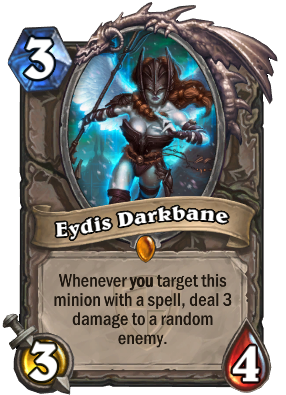 Eydis would be much better if her effect only targets minions. I think this card is actually somewhat misunderstood. Priest is probably not the ideal deck for it (not that it's bad by any means). Currently, the strongest priest deck is control dragon priest, and I would guess that this probably isn't going to change, given that priest is inherently a control class. In that deck you will probably have 4 buff spells at most. So 2 PW: Shields and 2 Velen's Chosen let's say. This gives you 4 possible moments to proc Eydis, and on curve it's most likely to be PW: Shield. This is a great combination, but I would argue it's not a particularly reliable one. In dragon control priest, Dark Cultist is going to be the more consistent value, given your Lightbombs, given your big taunts (which is probably where PW: Shield will end up, if not on a Cleric). Instead of priest, I think this card is actually an auto-include in Mech Mage. You're going to get a variety of Spare Parts, all of which (except Time Rewinder, and Coolant (unless maybe you're desperate)) you can play on Eydis. Counting the Spare Parts in an average Mech Mage deck, from some variation of Clockwork Gnomes, Tinkertown Technicians, Mechanical Yetis if you choose to use them, and Toshley if that's your thing, you'll have something like 4-6 spare parts to work with. Not only is that great for Eydis, it's great for Flamewakers, Mana Wyrms, and Antonidas, so not drawing Eydis is not the end of the world. The problem with a tempo deck like this right now is that it has a lot to fit into those 30 card slots, so it's going to take some time to figure out what the most consistent list is. Here's an early attempt I've made at such a deck: Eydis Ex Machina. As for Eydis in paladin, that sounds pretty interesting, I'll definitely have to give that a shot, but as Spare Parts go, there are just a lot more synergies with mage cards. In mage, you have to compare her to Flamewaker. She obviously has better stats, but isn't nearly as consistent. She's also worse at clearing tokens, which is relevant against Secret Paladin. In priest you can compare her to Dark Cultist, and I'd say they're about equal. I opened a golden version of her in my initial 50 packs. One of the rarest gets. Congratulations special snowflake, I did it too.